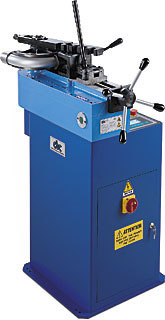 The UNI76 is an accurate and powerful bending machine able to bend large diameters pipes. The optimal and constant bending radii do not deform bent pipes: it is the ideal machine to satisfy every user’s exigency in the plumbing, nautical, hydraulic, industry and plants’ installation in general, above all in the ornamental field. - 3-phases 380V 50Hz asynchronus, self-braking motor (different voltages can be supplied on request)-2 speeds with 3/4Kw power. Digital electronic control board with microprocessor and display to set and control the required bend and recovery angle. It can store up to 50 bending programs. Each program can memorize up to 9 bending angles in sequence.